Much of the information below has been taken from the booklet "The Hethersett War Memorials 1914-1920" which was written by Bea Ewart and Bob Andrews and published in 2008. The booklet was a publication by the Hethersett Society and was supported by the Norfolk Rural Community Council and Hethersett Parish Council. We are grateful to Bea and Bob for permission to re-print information taken from articles. Hethersett's War Memorial is sited in the grounds of St Remigius Parish Church on the north side of the nave facing the pathway. It takes the form of a tall cross on a three-stepped plinth. A war shrine was proposed as early as December 1918 to commemorate the bravery of those who had lost their lives in the First World War. This was barely a month after the end of the war. A parish meeting to discuss the idea was held on 14th January, 1919. A committee was formed to steer the project and oversee the raising of funds. Two of the village war widows were co-opted onto the committee - wives of Arthur Hubbard and Frederick Curson. Initially a site for the memorial was offered in Cann's Lane by Mr W. H. M Andrews who had previously served as a captain in the Fourth Norfolk Regiment. This would have necessitated the widening of the road but there were insufficient funds for this and a further meeting was called. On October 7th, 1919, it was unanimously agreed that the memorial should take the form of a stone cross in the Churchyard - the site of the original proposal. The population of Hethersett according to the 1911 census was 1,093 (about one-sixth of what it is today). For the purposes of fund-raising the village was divided into sections with each household being visited. This resulted in £162 being realised (well over £4,000 in today's money). The cost of the memorial is not known but it was made by F.G Want and Sons of Dereham Road in Norwich. The Memorial was officially dedicated on Sunday 11 July 1920 and in December 1920 a border of flowers was put in place. The Parish Magazine of June 1920 lays out the organisation and programme for the dedication service which was designed to honour the dead and give thanks for the survival of the nation. "Seats will be reserved in church for the relatives, who are requested to follow immediately behind the choir and clergy in the procession to the memorial from the church. They are also invited to place wreaths on the memorial after the Dedication. The congregation are also requested to proceed to the churchyard. 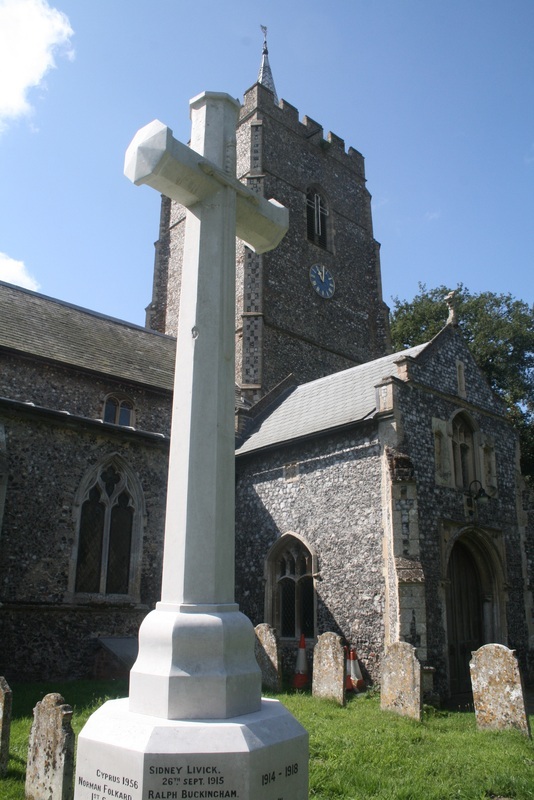 It is unnecessary to invite parishioners to be present on this occasion, as all who can will undoubtedly desire to take this opportunity of honouring the men of Hethersett who laid down their lives in the War. It is, however, hoped that all Parish Societies, Clubs and Organisations will endeavour to be present officially. Service will commence at 11 o'clock. The dedication will be as near noon as possible." Of course it is difficult now 100 years later to second guess how distraught the relatives will have been. Their grief will almost certainly have been tempered with immense pride for their lost loved ones. The hymns chosen were from the edition of Hymns Ancient and Modern adopted by St Remigius in February 1905. This War Memorial erected by public subscription to the memory of the men of this village, who fell in the war, was dedicated on Sunday. Canon Pelham preached an appropriate sermon at the usual matins service to an overflowing congregation, taking for his text "Underneath are everlasting arms." At the conclusion of an impressive service, in which the singing of both choir and congregation was splendid, the clergy, choir and congregation proceeded to the side of the memorial quite close to the north door of the church in the churchyard. Meanwhile the organist, Mr J. Sword, played the "Dead March." The memorial takes the form of a cross, a replica of the cross erected on the soldiers' graves in France, worked in Portland stone, standing on an octagonal base. The dedication ceremony was performed by Canon Pelham, assisted by the rector (the Rev F. Jarvis), after which the hymn beginning "Our life is but a fading dawn" was sung. A bugler from the Norfolk Regiment sounded The Last Post at the conclusion of the ceremony ........ Both of the local friendly societies, the Oddfellows and the Foresters were represented by contingents of members. The local company of bellringers rang a muffled peel on the church bells." Its glorious noon, how quickly past! 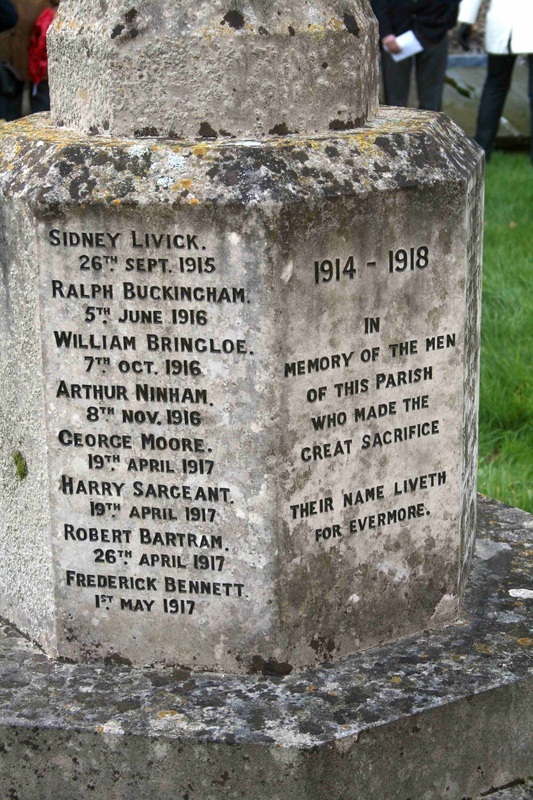 Seventeen men of the parish are remembered on the Memorial from the First World War and twelve from the Second. The inscription from the First World War reads: "1914-1918 In memory of the men of this parish who made the great sacrifice. Their name liveth for evermore." The memorial lists the names of those who lost their lives. They were - Sidney Livick on 26th September 1915, Ralph Buckingham 5th June 1916, William Bringloe 7th October 1916, Arthur Ninham 8th November 1916, George Moore 19th April 1917, Harry Sergeant 19th April 1917, Robert Bartram 26th April 1917, Frederick Bennett 1st May 1917, Frederick Blake on 14th May 1917, Harry Child on 17th May 1917, Arthur Shorten on 3rd November, 1917, Arthur Hubbard on 18th September 1918, Frederick Harvey on 8th December 1918, William Bishop on 4th November 1917, Horace Beaumont in February 1918, Benjamin Joy on 28th March, 1918 and Frederick Curson on 17th May, 1918. As an interesting aside, Church records show that there were two first World War incidents when evening services were changed to 3pm due to danger from hostile aircraft. The Parish Magazine of St Remigius Church, Hethersett, carried the unfolding story of steps to erect a war memorial. Here we follow the journey to provide a permanent memorial to those who gave their lives. It has recently been suggested that a War Shrine, containing the names of those men who have been killed or have died on Active Service, should be erected in a prominent position in the Parish. Everyone will feel that a permanent memorial should eventually be erected to these men somewhere in the Parish, something that is good and really worthy of them. Without in any way seeming to deprecate the proposal to erect a Shrine, one might suggest, now that the first rays of peace begin to lighten the horizon, that the time has almost arrived for the consideration of this permanent memorial. It is a matter which will call for very careful thought and cannot be carried out in a hurry. A Committee, representative of the various sides of our Parish life, must be called into being. This is merely a suggestion and suggestions from others will be welcomed. At any rate we all agree that it rests with us to perpetuate in a manner worthy of them, the willing sacrifice of those who during this war have laid down their lives that their country may live. A Parish Meeting to consider the question of erecting a War Memorial for Hethersett will be held in the Old School on Tuesday, January 14th at 8 p.m. It is perhaps desirable that our Memorial should be erected partly to commemorate those whose lives have been given in the War, and partly as a Thanks offering for Victory and for those whose lives have been spared to return to their homes, and partly as a Thanksgiving for Peace. In such a scheme as this all will doubtless desire to join. There will naturally be many proposals and suggestions, which will best be dealt with by a representative Committee. The primary purpose of the Meeting on January 14th (which it is hoped, will be well attended) is to get the matter started. Four Parish Meetings have been held to discuss the question of erecting a Memorial to those who have fallen in the War. Many suggestions have been considered and it has now been decided to erect some form of monument at the corner of Cann's Lane on a piece of land kindly offered by Mr W.H.M. Andrews. A Committee has been formed for the purpose of collecting funds and considering designs, consisting of the following: The Rector, Mr. H. Woods, Mr. Kent, Mr Woolner, Mr W. H. Back, Mrs. W. H. Back, Mr Bainbridge, Mr. Andrews, Mr G. Moore, Mr B. Joy. They have co-opted Mrs Hubbard and Mrs F. Curson. Mr H.W. Back has been elected Treasurer. For the purpose of collecting, the parish has been divided into sections and each house will be visited by one of the following collectors during May: Mr Andrews, Mr W.H. Back, Mrs W. H. Back, Mr Kent, the Rector or Mr. H. Woods. As it is desirable that a worthy Memorial should be erected it is hoped that all parishioners will subscribe generously. The answer of the District Council to the proposal to erect the Parish War memorial at the corner of Cann's Lane, and to the request for permission to widen the road for that purpose has now been received. This answer, which is not a favourable one, will be considered by the War Memorial Committee without delay, who will draw up recommendations, and if possible submit a design to a Parish Meeting to be held in the Old School on Tuesday October 7th at 8 p.m. It is hoped that all who are interested in the site and form of the Memorial will attend the meeting. At a Parish Meeting held on October 7th, it was resolved, without a dissentient vote, that the Memorial should take the form of a stone cross to be erected in the Churchyard as originally proposed. The site chosen is on the north side of the nave facing the pathway. It was further decided that any surplus money shall be invested in the names of the Rector and Churchwardens for the time being, the interest to be used for keeping the memorial and the grass around it in good order. The change of site is due to the reply of the District Council, to the effect that they will not give any assistance towards the erection of the memorial at the corner of Cann's Lane. The War Memorial is nearing completion and will shortly be erected. The Committee have decided to invite Canon S. Pelham to dedicate the memorial. The dedication will take place on Sunday July 11th after Morning Service. We shall long remember the dignified and beautiful service on Sunday, July 11th, when our Memorial was dedicated. The relatives of the men whose names are inscribed on the Cross, would wish to thank all who helped to make the service what it was. It would perhaps seem out of place here to congratulate one another, but we should like the Choir, the Organist, the Bell-ringers and all who so gladly gave their assistance, to know that their well rendered services were deeply appreciated on this occasion which meant so much to many of our parishioners. Especially we are grateful to Canon S. Pelham for coming over and giving us such a thoughtful and helpful address. At the last meeting of the Committee entrusted with the work of carrying out the scheme for our Parish Memorial to the men who gave their lives in the War, it was unanimously decided that to complete the work the ground surrounding the Cross needed leveling, and that a narrow flower border round the base would improve its appearance. This has now been done and the result is pleasing and satisfactory. Until the soil has properly settled people are particularly requested to refrain from running up and down the slope in front of the Cross, and to approach it only by the grass step on the right hand side. All expenses are paid up to date and there is sufficient money over to invest for the purpose of having a small permanent fund at our disposal to keep the Cross and surrounding ground in good order. The Committee desire that no artificial flowers be placed on the Memorial and that all flowers be removed as soon as dead. The following names from those killed in the Second World War (1939-1945) are included on the War Memorial. To read biographical details of these men please see our Second World War Section: Sidney Wreford - 31st May, 1940, Fred Foster - 1940, Raymond Coller - 10th December 1940. Frederick Boswell - 5th July 1941, John McAnally - 8th July 1941, Alan Colman - 17th January 1943, Ernest Yull - 1943, Louis Bunn - 23rd October 1943, Henry Jeckells - 3rd March 1944, N. Beaumont-Thomas - 20th September 1944, Percy Huggins - 4th January 1945, Jack Weston - 18th March 1945. The War Memorial also contains the name of Norman Folkard who was a sergeant with the Royal Norfolk Regiment. He was killed in action on September 1st, 1956, during the Cyprus Emergency, when the vehicle in which he was travelling left the road and went down a ravine. Sgt Folkard is buried in a cemetery in Nicosia. He was 22 years of age. In May 2014 it was announced by Hethersett Parish Council that the name of Albert "Ray" Childs would join his brother Harry in having his name added to the Memorial. The inclusion of the name would also co-incide with the cleaning of the memorial as a way of commemorating the centenary of the start of the First World War. Local historian Bea Ewart said she felt the omission of Ray Childs' name had been a "simple accident." "He could have been put on but it looks as if they didn’t know about him. Either that or the family were so cut up about their youngest son dying that they didn’t want to do anything or tell anyone,” she said. Ray Childs was gassed during active service in France 1918. Although he continued to serve in the war, he returned home to be hospitalised when his health deteriorated to “a precarious state”. He died aged 24 in 1919 and was buried in St Remigius Churchyard. The village stalwart - whose family name was honoured at the naming of Childs Road - was known to many as the secretary of the juvenile branch of the Rechabites Club and secretary of Hethersett Cricket Club. The addition will mark the second occasion that a name has been to the war memorial - Norman Folkard was included in 2011 after he was killed in action in 1956 during the Cyprus Emergency. 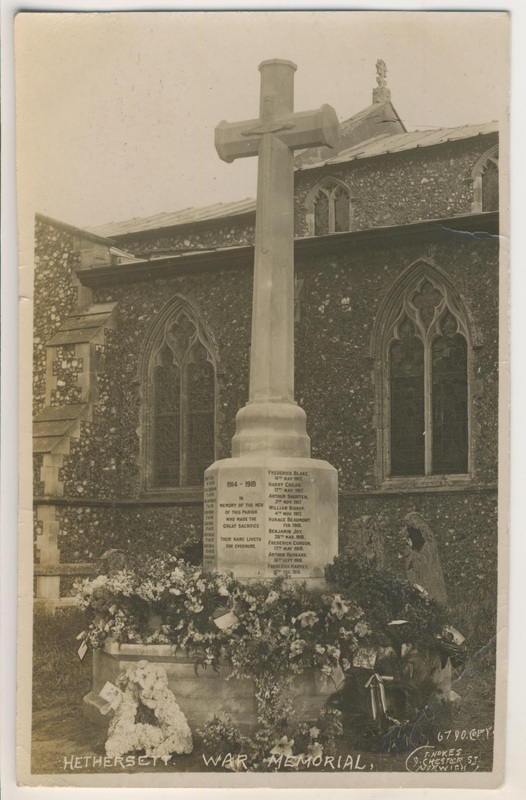 This photograph of Hethersett War Memorial was probably taken at the dedication ceremony on July 11th, 1920. It has the name T. Nokes of 9, Chester Street, Norwich, on the bottom right hand corner. Mr Noakes was a well known Norwich based photographer of the time. Many thanks to Hethersett Parish Councillor Stephen Slack for permission to use the image which is taken from his collection. The photograph above of Hethersett War Memorial was taken just over 94 years later on August 14th, 2014. It shows the sparkling clean-up achieved on the memorial and the name of Ray Childs has been added to the fallen from the first world war.